In the past, I have offered pet honoring kits. Here are some examples of contents and suggestions for items to include and the meaning behind them. Please contact me if you have any questions about holding your own pet memorial and I’d be delighted to assist in anyway I can! 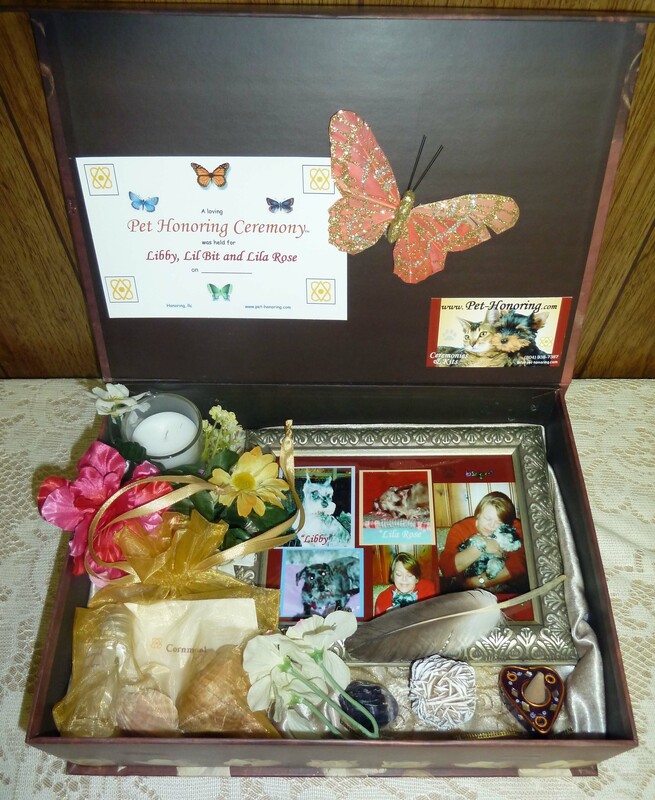 Created to assist someone in holding their own Honoring Ceremony for their Pet. The Kit includes everything needed: guidance, instructions, script and ceremonial items. The framework and structure is provided to be complete but also allows for customization. 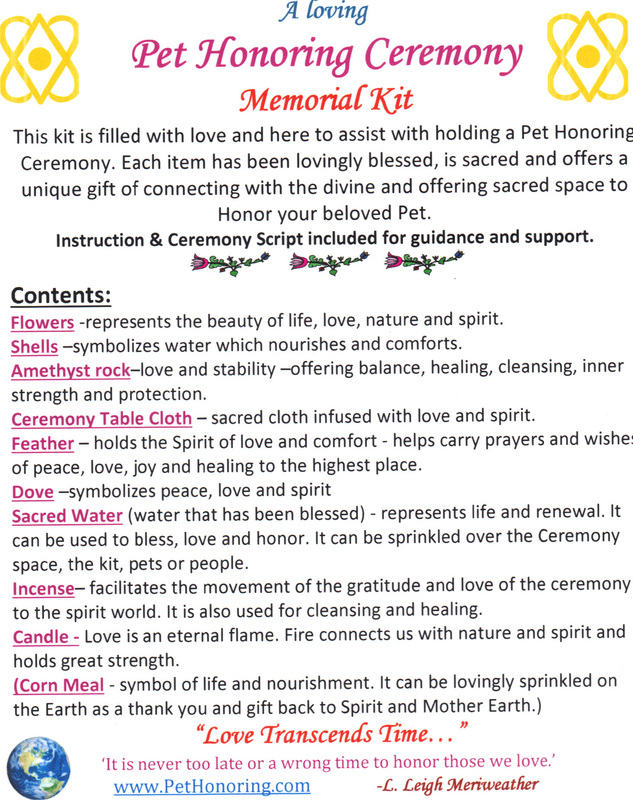 The Honoring Memorial Kits are also divinely and lovingly blessed and are created with the intent of assisting in Honoring and holds the Spirit of such. Items included: Ceremony Flowers, Picture Frame – 4×6, Candle, Shells, Feather, Desert Rose Stone, Butterfly, Sacred Water, Amethyst Tumble Stone, Incense, Ceremony Cloth, Decorative Commemorative Box, corn meal, Guidance and Instructions, Ceremony Script. The Kit also comes with a detailed description of the symbolic meaning and significance of each item for optional inclusion in ceremony. For those wishing to have a highly customized Honoring Kit. 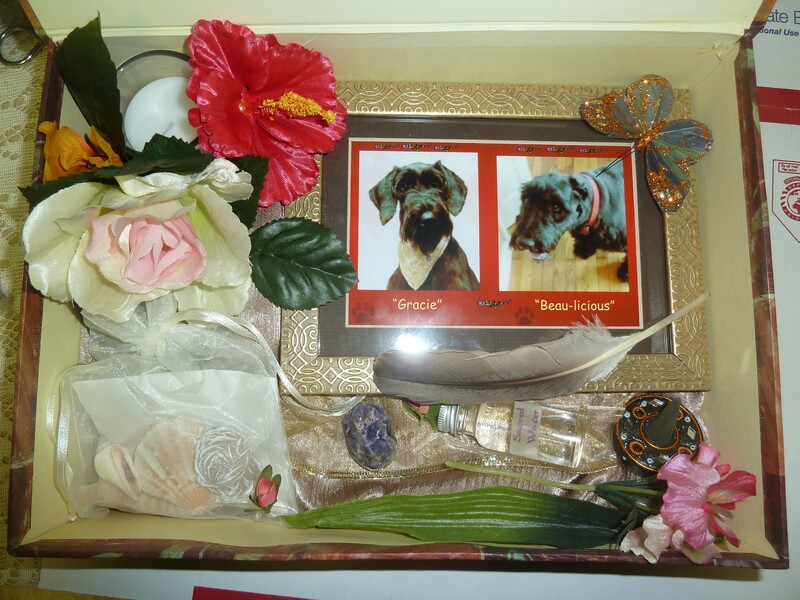 Can include a picture of your beloved pet framed with color choices of flowers or other customized items added in a memorial box. 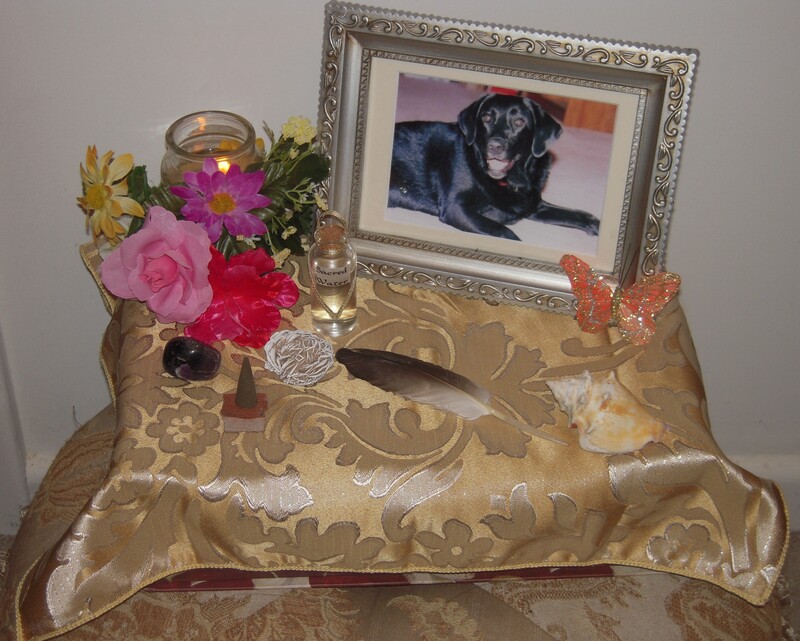 This Pet Honoring Memorial was specifically created for Gracie and Beau-licious. A customized ceremony script was designed for them as well and included. “I just knew whatever it was they would fix, and maybe keep her overnight. Never, ever, thought she would not be coming home. 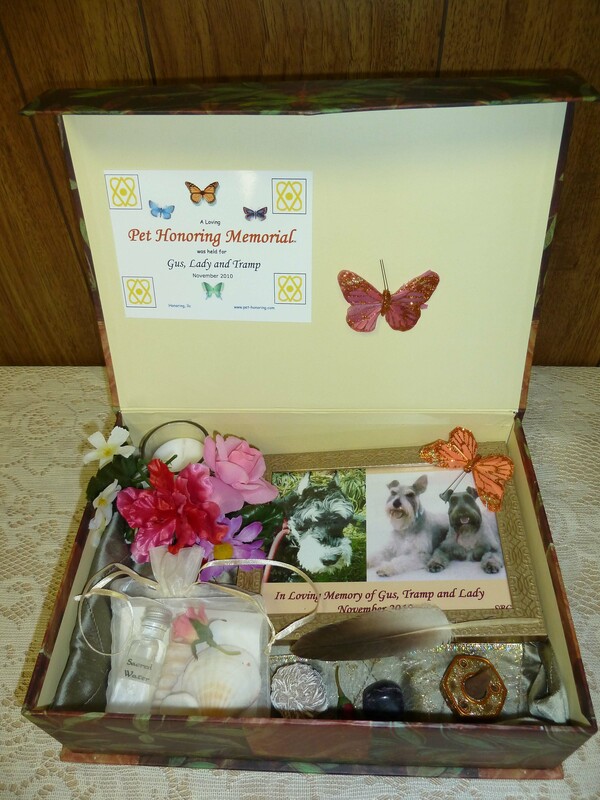 A Customized Pet Honoring Memorial Kit was created for three loving dogs. A ceremony script was created just for them. The three dogs all passed within a year. 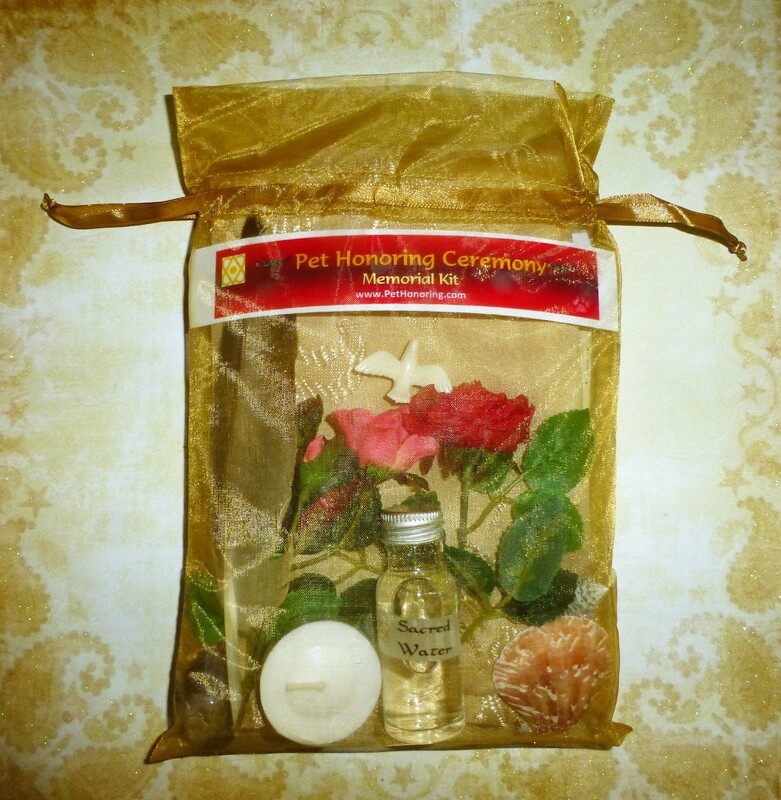 “A lovely Honoring Kit was waiting for me when I returned from the holiday. Thank SRC so much for remembering Lila Rose, Lil Bit, and Libby. Robbie and I had a tearful but meaningful time remembering how much joy our “girls” brought to us. I have three carved boxes of ashes and three casts of foot prints in my bedroom, so the “girls” are always close. Call for inquiries or to order. Online ordering available soon!